Looking to immerse yourself in that movie or music on your new TV? Then consider an AV receiver to take the sounds to another level. PAT PILCHER gives us the lowdown on what to consider before you buy. If you’ve just splashed out on a fancy new TV, odds are that you’re already finding its audio lacking. Thinner screens mean less space for decent sized speakers and little to no space for resonant cavities to deliver added bass. But for great sound in your TV room, your best bet isn’t a sound bar. As good as they are, the reality is that an AV receiver and even half decent speakers will offer superior audio – especially when it comes to music. HDMI: With nearly all video capable gadgets using HDMI, the number of available HDMI inputs on a receiver is a key feature to look for. Wireless: Built-in wireless (AirPlay, Bluetooth and so on) is one feature you’ll probably use. Being able to wirelessly stream music from a smartphone/tablet to your receiver is incredibly handy. Sound quality: All manufacturers without exception tout their receiver’s audio quality, but sound quality is massively overhyped. Regardless of what make or model receiver you buy, it’ll still sound a million times better than your TV/soundbar. Most audible differences between AV receivers are barely noticeable. Wattage: Output power ratings are not standard. 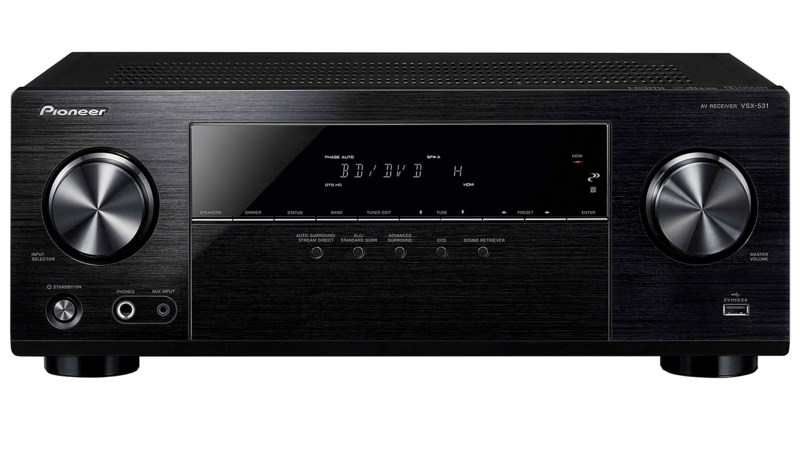 One brand’s 100-watt-per-channel receiver might be comparable to another brand’s 50-watt-per-channel receiver. The most important consideration is the amount of power needed to drive the speakers you have connected. Check with your speaker manuals for more information. 5.1 vs 7.1: A 5.1 speaker config offers audio that’s more immersive than anything you’ll get with stereo. That said, the differences between 5.1 and 7.1 are not huge. There’s also not much content with 7.1-channel soundtracks. Instead of paying more for those two extra channels you’ll hardly ever use, invest in better speakers where you’ll get a noticeable improvement. Automatic speaker setup: It sounds like a great idea, but more often than not it doesn’t deliver good results. You’re probably better off using your receiver’s manual to figure out how to manually calibrate everything. THX: THX certified receivers don’t offer big improvements in audio over non-certified counterparts. A non-THX certified receiver will probably sound fine and will save you money that can be spent on better speakers. Getting an AV amp without HDMI is almost impossible these days. The big benefit of this is that an HDMI equipped AV receiver can act as a video/audio switcher. Power on your Blu-ray player and thanks to the wonders of HDMI your amp and TV should power up and switch to the correct inputs. Another big benefit is that HDMI reduces cable clutter. Just one HDMI cable does the job of 3-6 analogue cables. Then there’s the not so small matter of nearly all video gadgets using HDMI these days. So how many HDMI ports will you need? There’s no simple answer, sorry.. Six might be just enough for many, while some may only need four. Either way, get a receiver with at least one or two more HDMI inputs than you need as the odds are good that you’ll need to expand. The other consideration is that there is HDMI and HDMI. With 4K TVs and streaming services popping up, buying a receiver that can handle 4K video is good future proofing. Look for HDMI 2.0a and HDCP 2.2 capable HDMI inputs when buying a receiver. TLDR: Buy an amp with at least one more HDMI port than you currently need. If using 4K or future proofing look for HDMI 2.0a and HDCP 2.2 support. 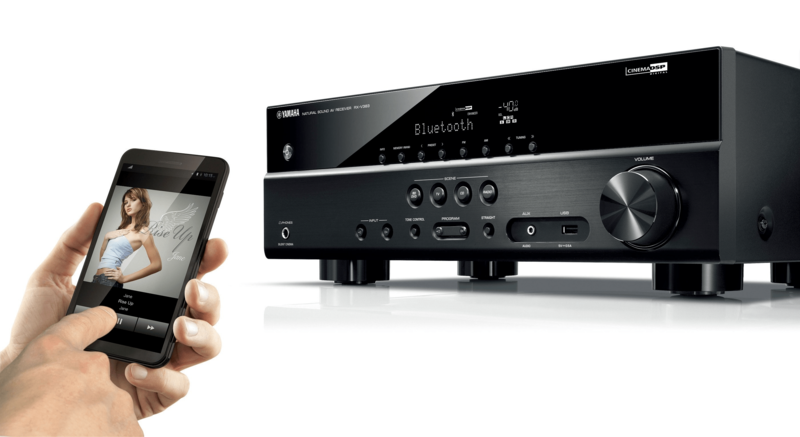 A key feature with most AV receivers nowadays is support for wireless technologies such as AirPlay and Bluetooth. While many receiver makers have long added features that just aren’t useful, Bluetooth/AirPlay are both likely to become part of your daily AV repertoire. Being able to wirelessly stream music from a phone or tablet to your AV receiver is insanely handy. It’s taken a few years, but a growing number of AV gear makers are finally building Wi-Fi into their receivers. With wireless comes access to streaming services such as Spotify. You can install an external adaptor to stream audio, but built-in streaming is far more convenient. It isn’t just Wi-Fi either. There’s also Ethernet. Network connectivity also allows for smartphone apps to control the amp, firmware updates for future proofing and access to streaming services. Every brand says its receivers generate the best audio, but our advice at WitchDoctor for budget buyers would be to not worry too much about sound quality when buying an AV receiver. That may seem like counterintuitive, if not sacrilegious, advice, but the reality is that with most AV receivers the difference is almost inaudible. This is an oft debated issue amongst audio aficionados, but it is fair to say that except for a small number of stinkers, AV receivers in the same price bands are usually much of a muchness audio output-wise. There one an important caveat to this: Most AV receivers can deliver great sound for movies, but often lack when it comes to music. Either way, the reality is that aside from a bunch of arcane measurements, audio quality is really a subjective thing. Trust your ears and have a listen to music you know on any receiver you’re considering. If buying second hand, you’ll probably find most receivers are at last a few years old. This could mean they don’t support newer surround formats such as Dolby TrueHD and DTS Master Audio. Don’t stress, though, as the differences between these newer formats and their older versions – Dolby digital and DTS – can be hard to pick. 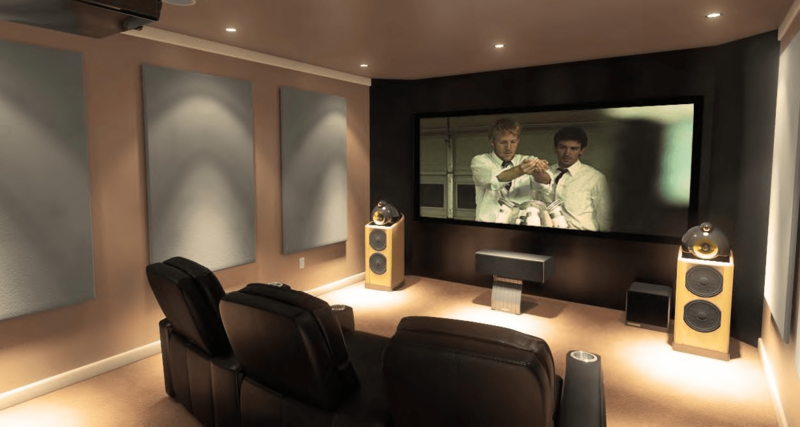 Some receiver manufacturers make a big deal about their gear supporting 7.1 surround setups. but in most cases the hype doesn’t live up to the reality. While 5.1 will sound noticeably better than plain old stereo, the difference between 5.1 and 7.1 isn’t all that apparent. Adding further credence to this is the not so minor fact that there isn’t all that much content with 7.1-channel soundtracks. This includes Dolby Atmos which uses at least seven channels, but there is hardly any content that is Atmos encoded. As many cinema audio fans have also pointed out, Atmos can be fiddly and messy. Placing ceiling-pointing speakers around or on top of existing speakers, leads to extra clutter for dubious improvements. Short of doing a costly professional Atmos install, you’re probably better off spending the extra money on better (instead of more) speakers. Amplifier power ratings aren’t standardised. There’s no guarantee one brand’s 150-watt-per-channel receiver will sound any better or deliver more power than another company’s 50-watt-per-channel receiver. Most big brand home theatre receivers are built with generous power supplies and amp outputs so can offer plenty of power. The reality is that you’re rarely going to crank your receiver up, so it’ll spend most of its time idling. That said, mismatching speakers and amps/receivers can lead to costly repair bills, so do check your receivers (and speakers) manuals to make sure that you are not taxing your amplifier module or running the risk of blowing your speakers. TLDR: Wattage specs are not measured the same way by most manufacturers. Refer to your receiver and speaker manuals for more information on how much output power you can safely use without damaging your gear. Automatic speaker calibration is one of those things that sounds great but offers diminishing returns. In practice, hooking up the supplied mic and letting your receiver play test tones doesn’t always do the best job of calibrating its audio. You may find that you get better results with reading your receiver’s manual and calibrating it manually. Amplifier: An amplifier provides power to a loudspeaker or subwoofer. It takes low voltage line level audio and outputs it at sufficient power to drive a loudspeaker. An amplifier can be part of an A/V receiver, a standalone product or built into a speaker. Attenuate: Attenuation is the reduction in volume or output of an electrical signal. Bi-wiring: Running separate speaker wires from the amplifier to the tweeters of a speaker and from the amplifier to the woofers. This involves removing the jumper that connects the tweeter and woofer inputs of the speaker. Not all speakers are able to be bi-wired. Bluetooth: A wireless streaming format that allows high resolution stereo audio streaming. Bridging: Bridging involves using a compatible amplifier to use two channels of amplification to drive a more powerful single channel of amplification. One amp typically drives the positive side while another drives the negative side of the circuit. Brightness (audio): This refers to high frequencies (e.g. cymbals crash, flutes play, or anytime Gary Steel sings). Channel: This refers to the paths where audio goes. Two-channel (stereo) systems deliver independent left and right audio channels while 5.1-channel surround systems have six “channels” (left, centre, right, surround left, surround right and a subwoofer). 7.1 can use rear or ceiling mounted speakers to supposedly deliver increased audio immersion. DSP: “Digital Signal Processing”. DSP’s can change the characteristics of a digital audio. This is how many AV receivers have stadium effects, plus delays or even wider stereo or simulated 5.1 surround audio. Dynamic Range: This is the difference between the loudest and softest parts of an audio signal. Most studio crafted music has little dynamic range. Orchestral music has tonnes of it. Frequency: This refers to the number of times per second air is moved by a source such as a speaker driver. High frequency sounds are handled by tweeters while lows are managed woofers. The accepted norm for human hearing is 20Hz – 20 kHz. This changes with age and most people’s hearing beyond 30 tops out at around 15-16kHz. Low Frequencies (below 20Hz) are often “felt” rather than heard. HDCP: This is a mandatory copy protection scheme developed by movie studios to protect them from direct digital copying. HDMI: Provides digital audio and video using a single cable. The newest standard is HDMI 2.0. It supports 4K resolution, 3D and up to 32 channels of audio over a single cable. “High speed” HDMI cables should always be purchased as they are more likely to be compatible with the latest technologies and consumers need to pay attention to the labels since several of HDMI’s features are optional and not included on all cables. Beware of snake oil sales people attempting to charge significantly higher prices for “high quality” HDMI cables. The only premium for HDMI should be for extra-long cables as HDMI signals will fade out for low quality cables as short as 15 feet (4.5 metres). High quality HDMI cabling should be able to carry a signal for up to 50 feet (15.24 metres) before any signal loss becomes noticeable. Hz (Hertz): refers to the number of times a second of a sound frequency. Impedance: Impedance is the resistance a speaker has to an amp. It is deduced by the way a loudspeaker is constructed and effects the amount of current able to be sent to the speaker from the amplifier. Higher impedance means the speaker is more difficult to drive and thus requires more amplifier power. kHz: 1 kilohertz equals 1,000 Hertz (Hz) (See Hertz). LFE: This is an audio bandwidth-limited channel (20-120Hz) in a movie soundtrack which contains Low Frequency Effects. This is where the “.1” in a 5.1 or 7.1 comes from and is usually handled by the subwoofer. It typically is used to deliver audio of explosions. Midrange: Midrange is much of a movie or music tracks audio is located. It is literally the centre of the audio spectrum sitting between bass and treble. It is usually a frequency range from 600Hz to 1.5Khz. Upper mids can go up to 2.5kHz. Mono: Referred to by posh folk as monophonic, audio that uses a single speaker or channel. Ohm: The noise our editor makes as he gets our expense claims. Ohms is also a measure of Impedance or resistance to the flow of electricity. An 8-ohm speaker presents more resistance to an amplifier than a 4-ohm speaker (see impedance). Power Output: This is the amount of amplification an amp can put out given a particular input voltage. The results are given in watts but there are confusingly various standards by which power output is measured. Look for Root Mean Square (watts RMS) per channel in the specs as it is easy to be fooled by marketing blurb. If a cheapish receivers blurb says it outputs an improbable amount of power, it could be referring to Peak Music Power Output (PMPO) which isn’t seen by many as a meaningful amp output power measurement. Receiver: A receiver, or AV receiver, serves as a switcher, processor and amplifier for audio and video devices. It typically includes an AM/FM tuner as well as Internet radio. It will also contain amplifiers so that input signals can be sent out at speaker level. RMS (Root Mean Square): We could get all techie about how this is calculated, but RMS is a way to more effectively communicate the power transferred from an amplifier to a loudspeaker. Using RMS values, average power equals the voltage multiplied by the current of the output device. Sensitivity: The measure of how much output you can expect from a speaker given a particular amount of input power. Sensitivity is typically stated as the amount of decibels SPL achieved when feeding the speaker 1 watt of power (2.83V at 8-ohms) and measured from 1 meter away. Sensitivity specs often vary hugely from manufacturer to manufacturer. Signal-to-Noise Ratio (SNR): This is the difference between an input signal level and the noise floor of the system. A high SNR is better than a lower one. Soundstage: The area between two speakers where the music is taking place is known as a soundstage. Good soundstages should let the listener point to the placement of individual instruments. Speaker: A speaker takes an electrical signal and converts it into mechanical energy that moves air, so we can hear sound. SPL (Sound-Pressure Level): This measures air pressure from audio frequencies. SPL is measured in decibels (dB). Subwoofer (AKA Sub): It can refer to a dachshund but more commonly a subwoofer is a speaker tuned to handle low frequencies, such as those emanating from the LFE track. A subwoofer should be able to reproduce frequencies below 80Hz. THD (AKA Total Harmonic Distortion): Not to be confused with THC. THD refers to sounds being reproduced and amplified with a percentage of additional noise added in the area of harmonic frequencies. A low THD means cleaner sound. Tweeter: It reproduces the highest frequencies in a loudspeaker. There are many varieties, but tweeters typically handle frequencies from 5kHz upwards. Watt: The watt is the basic unit of power. More watts equal more power. Watts relate to both voltage and current. A Really informative and useful article, thanks!